The full moon of June will dip through Earth's shadow early Monday (June 4) in a partial lunar eclipse that promises to impress skywatchers graced with good weather. Eclipses of the sun and moon always come in groups. A solar eclipse is always accompanied by a lunar eclipse two weeks before or after it, since over those two weeks the moon travels halfway around in its orbit and is likely to form another almost straight line with the earth and sun. If the solar eclipse is a “central” one — that is, either total or annular — the lunar eclipse is likely to be one where the moon will only partially interact with the shadow of the Earth. And the so it is that two weeks after casting its shadow over eastern Asia and western North America in the annular solar eclipse of May 20-21, next Monday’s full moon will swing around to skim through the northern edge of the earth’s own shadow. Those regions of our globe that enjoyed views of the solar eclipse will again be favored for a view of the upcoming lunar eclipse. Nearly two-fifths of the moon will slowly slip into the Earth’s umbral shadow. 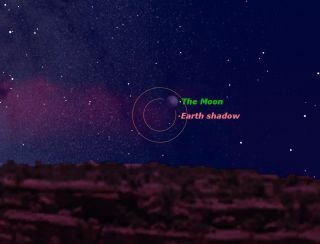 Although the moon will remain bright throughout the partial lunar eclipse of June 4, it will be set in a very interesting starry background: just inside the border of the non-zodiacal constellation of Ophiuchus, the serpent holder and about 6 degrees above and to the left of the bright ruddy star, Antares. Since the moon will track well to the north of the center of the shadow, it will be its lower portion that will be darkened. Around that time — about 50 minutes later — the lower left portion of the moon’s disk should begin to show signs of a slight smudge or shading as the moon progresses into the darker/inner portion of the penumbral shadow. A little over 20 minutes later, the partial eclipse commences with first umbral contact at 6 a.m. EDT (1000 GMT). Now the moon is entering the umbra; the dark inner portion of the Earth’s shadow. Mid-eclipse comes at 7:04 a.m. EDT (1104 GMT), when the lower 37 percent of the moon will be tucked inside the umbra. To the unaided eye the umbra might appear dark and colorless, but binoculars or a telescope might show it glowing dimly orange, red or brown. You may find it impossible to judge the darkness of the eclipsed portion accurately owing to the glare from the rest of the moon. The partial phase lasts a bit over two hours and ends at 8:06 a.m. EDT (1206 GMT). Finally, the moon will leave the penumbral shadow at 9:18 a.m. EDT (1318 GMT). This partial lunar eclipse will be visible primarily across the western and central parts of the United States and Canada during the dawn hours as the moon descends the west-southwest sky. Draw a line roughly from Brochet, Manitoba, southeast to Sault Ste. Marie and then down to Cape Lookout, North Carolina. Everywhere to the right (east) of this line sees the moon set before it enters the dark umbra; aside from perhaps some slight penumbral shading, the full moon will pretty much retain its normal appearance for the middle Atlantic states and New England. Conversely, places to the left (west) of the line will see at least a part of the moon’s disk within the umbra before it sets. The farther west you go, the more of the eclipse will be visible, and for most places in the Pacific Time zone, the entire 2+ hours of partial eclipse will be visible before moonset. This might be better referred to as the “Pacific Rim Eclipse,” for not only is western North America favorably placed to view it, but so too are Kamchatka, Japan, Leyte, Mindanao and Java, all of which will see the moon rise as the partial eclipse begins on the evening of June 4. For Australia and New Zealand the eclipse takes place later in the evening. At the instant of mid-eclipse, the moon will lie in the zenith from a point in the South Pacific Ocean about 5,000 miles (3,100 km) southwest of Hawaii. This is not far from the Kingdom of Tonga, an archipelago comprising 176 islands scattered over 270,000 square miles (700,000 square km) of ocean. The moon’s exit from the penumbra 9:18 a.m. EDT (1318 GMT) occurs after moonset for North America. Monday's partial lunar eclipse is not the only amazing sky sight coming next week. On Tuesday, June 5, comes the much-anticipated transit of Venus across the face of the sun. The event, which will be visible from North America on Tuesday, but begins on Wednesday, June 6 for observers in the Eastern Hemisphere, is the last time anyone alive today will be able to see a rare Venus transit. The next transit of Venus won't occur for 105 years, in 2117. Editor's note: If you snap a great photo of the partial lunar eclipse and would like to share it with SPACE.com for a story or gallery, please send images and comments to SPACE.com managing editor Tariq Malik at tmalik@space.com.